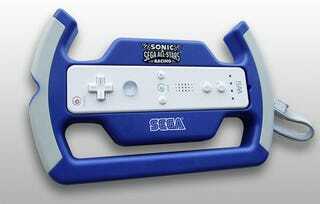 Sega of Europe, perhaps seeing the sales boost a plastic shell that looks like a steering wheel and holds a Wii Remote can offer a game, is giving Sonic & Sega All-Stars Racing the Wii wheel bundle treatment. Oh, but only in the UK, for now, where Sega seems more willing to offer bundles and deluxe packages for its games. (What's up with that, Sega?) You can head over to the Sonic City Blognik to admire the UK's bulkier box for the Wii version of Sonic & Sega All-Stars Racing while I ponder my fascination with games starring Sega mascots. Say, anyone out there in Kotakuland getting this? The game, I mean, not the fancy Wii Remote holder.